It was about 4 in the afternoon, last Thursday, 28th of April, 2011. I had just got back to my cabin after a team meeting at work. The mobile rang. It was my aunt. And then the words that are still ringing in my mind. Dadu was my grandfather, my mom's dad, Late Narendra Nath Roy. We rushed to Kolkata that evening. Meeting my brother and sister in law at the airport who flew in from Delhi. We headed home late at night. And then next morning to Dadu's house. The veranda was empty. This is where he would always sit. Breaking into a big smile whenever I went there. The veranda where he and my grandmother, Didu, would come to bid me farewell whenever I left after visiting them. Each time I would look at them as I left and silently hope that they would be there when I came back. Then my luck gave in. Dadu wasn't there this time. Didu sitting inside in a daze. Alone in a world they had built together over sixty six years. This post has been pending for over a week. Each day there would be a fresh set of emotions. A fresh set of memories. Words I meant to write. The stress, the shock, the rituals, the fatigue, the company of family, the pain, the heat, the sense of familiarity in returning home, the escapes into work, into playing with the blog template, TV and The Family Guy ... the post remained unwritten. I finally started writing today after returning from work. On the office laptop while checking mails. Writing on a Word file. A trip to the doctor and physio in between for a bad back, stopping to meet friends on the way back, dinner at home, more TV and the post remained incomplete. Somewhere I knew that what I had written was contrived, not from the heart. That I was trying to remember all the pithy lines that had flashed in my head over the past few days. "He had put the grand into grandchildren" ... "there is no colour as fierce as a widow's white" ... "The Metro passed by as the hearse went below the bridge. His beloved Railways saluting him on his last journey. RIP Dadu " ... "Went to the local market to buy fish for Dadu's funeral rituals tomorrow. Choosing the fish, checking that they were fresh, specifying the cuts. Cathartic" ..."Of all the stories that they had told me, none was sweeter than the story Didu told me of how she met Dadu" ... "should I write about how he died alone in the hospital or of how he came to visit us everyday while we were growing up" ..." The priest explained all the rituals in the prayer ceremony for a man who didn't believe in rituals. Sometimes it gives closure for those left behind I guess" ... "Exactly a week since the phone call one would so like to wish away" .. Some were lines I Tweeted or updated on Facebook since Thursday. Others I had intended to write on the blog. But when I tried to put them down they seemed so fake. I closed the file, shut the comp. Ready to sleep. And then it struck me. I am his eldest grandson. 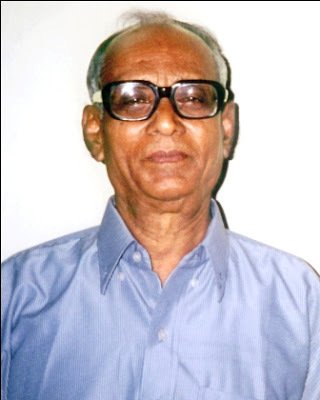 The first person Dadu called 'Dadu' in keeping with the quaint Bengali tradition. In a way the responsibility of saying a eulogy was mine. At least amongst his grandchildren. Every religion has its was of making peace with death. To the best of my knowledge there is no practise of saying a eulogy during the last rites of Hindus unlike in Christianity. But then rules and orthodoxy had never held Dadu back. So I switched on my own laptop at night. Decided to skip the earlier Word file and type away directly on the painful Blogger interface. Blurting out words as they came. Without a thought on how they would read. Without a thought on whether they had a food connect. Without a thought on who would read it and what they would think. This was not about me. Or was it? Doesn't really matter. Should I write of my memories of him? Of how my first stop in India was at his house at Pandarara Road at Delhi. Of how I was told that all the taxis around were 'Dadu's cars'. I used to think that everyone had a car then. I was four when I first met him. What could one write about the man who taught me to 'read'? Telling tales of history, of world wars, of Nazis and Hitler and concentration camps. An eight year old lapping up the stories his grandfather would read out from his books during the summer holidays. Till the grandson was old enough to read his grandfather's favourite and much thumbed Lean Uris, Dominique Lapier, Forsythe and Larry Collins novels. Though, unlike him, I could never finish Conrad's Lord Jim, one of his favourites. Of how he taught me not to give up hope as I battled with Trigonometry and Mechanical Physics in High School. Supporting me to go against the grain and conventional norms and pursue the arts instead of engineering or medicine. Giving me the courage to dream and explore which eventually helped me leave the nest and move to Mumbai. He taught us never to be fazed by what life threw at one. To pick oneself up from the dust no matter how battered one was. Smiling. Quoting the Geeta, "Do your best, don't worry about the results". I was talking with Didu, my grandmother, a couple of days back. I wanted to know how they met. And so the eighty two year old lady started her story. There was a fondness in her voice, a slight smile crossed the tired face. Aching knees, walking stick, failing eyes, weary bones set aside for a short while as she went back to when she was a rather tomboyish young girl who used to climb trees and pluck mangoes. She told me their story which spanned two countries, five cities and close to seven decades. Of a young man who went to see a young girl of about fifteen at Bangladesh while it was still India and ruled by the British. Of his deciding to get married and yet feeling to embarrassed to tell his colleagues. Of getting married and looking for new opportunities in newspaper classifieds to improve his family's lot. Of studying a new discipline - librarianship. Of giving up his job at Jalpaiguri College as a Buchanan trained physical trainer. Joining the library of the American Institute in far off Allahabad when young Didu had gone home for the holidays. Of their life together in the harsh dry heat of Allahabad till Didu went back to her native Bangladesh expecting their first born, my mother. Of applying for a new job. The Railways in newly independent India. His job at Shastri Bhavan at Delhi. he later told Didu that he secretly went to Delhi and tried for the job. And many other jobs while she was away. Whoever would send him train tickets to come for the interview. Driven by a desire to give the family the two were starting a better life. "You would never have let me go if I told you but then we would always be poor". "Did he discuss work with you", I asked Didu. Wondering if things were different in their times. Perhaps a stupid question given that he encouraged his son and his daughters to study and become independent. And took as much pride, if not more, in his granddaughters as he did in his grandsons. Right from the eldest to the youngest. He could not stop talking about us to those who would lend him an ear. "Of course he did" said Didu. "He used to drive me mad as he would tell me each and everything that happened at work. Everyday". Fond memories blending in with sad ones of the ninety one year old gentleman who would wake up from his sleep to go to her room and get things off his chest in the last few days. The Railways is where Dadu finally retired. Proud of being a 'gazetted officer, first class' as he would often tell us. Proud of being asked by Jagjivan Ram the Railway minister then to organise the political luminary's personal library. The Railways quenched Dadu's wanderlust. He would use the train passes he got to travel across the country with his family. It was not just his love for reading that I had inherited apparently. His love for the Railways never waned. He travelled as long as he could even after he retired. Reaching the station more than three hours early. As Didu would point out, Dadu was not a field man and yet the smell of the trains or even the platforms lit up his senses. He was proud when the Metro at Kolkata finally came to our suburbs. I wonder if he knew that Mahendra Singh Dhoni, an ex Railways ticket collector, had led India to victory in the Cricket World cup. Towards the end Dadu was convinced that his lungs were clogged with the dust from the archives of the Indian Railways whose library he had set up. As this gutsy fighter battled illness he thought that he should go to the Railway Hospital at Delhi to get the dust of the Railways out of his system. He finally hung his gloves after a long struggle. But as Didu bravely said, we should be thankful that he was not bedridden. Old age is indeed cruel. A friend asked me today if I was close to Dadu. Well he was the first person I met when I came to India. We lived at his house for a year after my father passed away soon after. Dadu would come to visit us everyday after we moved out to look after us and give us company while my mother returned from work. Never letting us feel that we were children of a single parent. Telling us stories, encouraging us to dream ...fretting if we looked gloomy or distressed or defeated... trying to make us smile through light hearted banter. Dadu wanted to go the beaches of his favourite Puri. Convinced that the fresh breeze, 'ozone' and water would fix him up. With age and weakened hearing it was difficult to make him understand why he couldn't go to Puri. He would keep pleading to whoever would come to meet him. And to Didu day in and day out. "Take me to Puri. I will become fine". And yet his only trips would be to the hospital. I kept remembering his pleas to take him to Puri as I sat recently at Sydney's Manly beach. Like everyone else I was helpless too. The first thing K told me when I returned home shell shocked last Thursday was "He has gone to Puri." I sure hope that he has. RIP Dadu. All of us miss you. This is straight from your heart,I guess this post will refresh quite a few memories revolving my dear departed ones!Made me quite emotional..again heartiest condolences to all your family from all of us. Such a beautiful post Knife...u have done Dadu proud. Is Didu living alone now? I hope she will have some company - it must be terrible to be alone after so many years of togetherness. I know I am supposed to say condolences but actually am feeling a lil J, I didnt have the chance to see either of my grandfathers and have never had the luxury of hearing stories or riding on their shoulders. U guys have been so lucky. This is the best post that you have written. My eyes brimmed with tears. He must have been so proud of you, Kalyan. I loved my grandparents, who are sadly now no more. As C says, we need to have that "Talk about our grandparents" evening. Your dadu lived such a full life. I wish that I had met him. R.I.P. I am extremely sorry to hear about your Dadu. I remember my grandpa's demise when I was away in China(I thought this is so unfair,cause I had bought a walking stick for him which he could no more use). All said it is a part of life but no one could understand what I had in my mind. I am extremely sorry to hear about your Dadu. I remember my grandpa's demise when I was away in China(I thought this is so unfair,cause I had bought a walking stick for him which he could no more use). All said it is a part of life but no one could understand what I had in my mind. Give a lot of care and affection to Dida from your side. She needs it. So sorry to your about your loss, Kalyan. One generation gone, never to be replaced. But your memories are warm and fulfilling, and your love and respect for him is obvious. My heartfelt condolences to you and your family. Today we did puja for him as I am staying in his house to look after ur didu. I remembered him very much today thinking how much he loved us even during his illness. Remembered how he clasped my hand all the way when we took him to hospital for the last time. RIP.